I clearly remember as a young child being fascinated with the Komodo Dragon. I do not recall the catalyst for this fascination--likely something I saw on Wild Kingdom or a video in school--but every time I see one, I have that same sense of mysterious wonder. 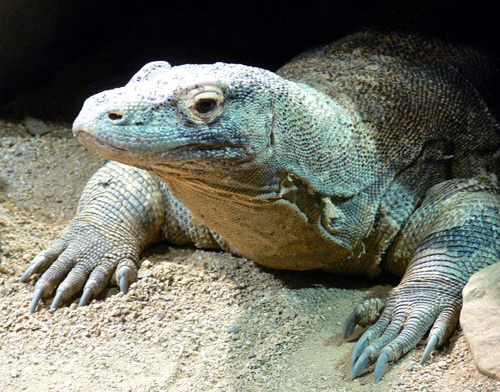 The Komodo Dragon at Zoo Atlanta does not disappoint...theirs is a fine specimen. I also learned on a visit to Zoo Atlanta that the Komodo Dragon is the only lizard that will attack prey that is larger than itself...sounds like my ex-wife at an all-you-can-eat buffet! I'm only kidding...there is no ex-wife. But that kind of approach does remind me of a miniature pincer I once observed in Piedmont Park. It didn't care how big the other dogs were, it was going to let them all know who was King of his three square feet of the park. There are more "dragons" in Atlanta than you might think. From the Dragons, Mermaids, and Unicorns exhibition at the Fernbank Museum of Natural History, the annual Dragon*Con convention in Downtown Atlanta, the Leafy Sea Dragons at Georgia Aquarium, the annual Atlanta Dragon Boat Festival at Lake Lanier, to the Komodo Dragon at Zoo Atlanta...who would have ever guessed that Atlanta's Phoenix had so many dragon friends?